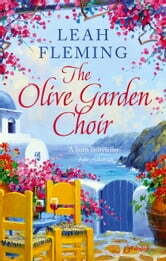 An evocative novel of secrets, love and redemption under the Greek sun. Perfect for fans of Kate Furnivall and Julia Gregson. On the beautiful island of Santaniki, close to Crete, it's not all white sands and sunshine. When retired bookseller Ariadne Blunt suggests the English residents form a choir, there are groans of resistance. After a little persuasion, the group gather in Ariadne's olive garden to rehearse, but each member of this choir has their own anxieties and secrets. Ariadne's partner, Hebe, is in failing health. Clive struggles to accept the loss of his wife while Della, the Pilates teacher, drinks too much and Chloe, Queen Bee of the village society, faces a family dilemma. Then there is Mel, the real songbird amongst them, English wife of a taverna owner who hides her talent until the choir inspires her to raise her voice once more. In this tiny community, the choir brings the residents together like never before in a bittersweet tale of love and loss – and how life can begin again when you let go of the past. Wonderful read as always. Leah takes you to the places she writes about and introduces you to the people. Long may she write. A Real Treat to Read! If you're looking for a super read encompassing a whole community - look no further! Ariadne and her partner Hebe have settled on the island of Santaniki, close to Crete, where there are plenty of other ex-pats to socialise with. Ariadne comes up with the idea of getting everyone singing together with a community choir, and as it's heading towards the festive season, perhaps a Carol Concert for Christmas. As we get to know the inhabitants, there is plenty to find out about them all. Secrets and lies come tumbling out as well as events which change their focus. This is a lively read; with a good spread of ages and nationalities, it is a lovely warm read and one which I took to my heart. There is lots going on to keep the reader's attention; the characters are many, varied and so true to life! Both well plotted and extremely well written, this is my first Leah Fleming novel and I really hope it won't be my last. A real treat to read, and well worth a full five stars. A book that is ideal for the beach or beside the pool. Good characterisation a bit sweet but absorbing for all that. I will look out for others by this author.